The second-to-last day of the SXSW Music Festival here in Austin was the hottest day of the week by far. Jeans and hoodies made way for shorts and t-shirts as the music kept playing into the cool, comfortable and breezy evening. Here’s our recap of Friday’s highlights from the showcases at Cedar Street Courtyard and Hotel Vegas. Catch up on all our SXSW highlights from earlier in the week right here. 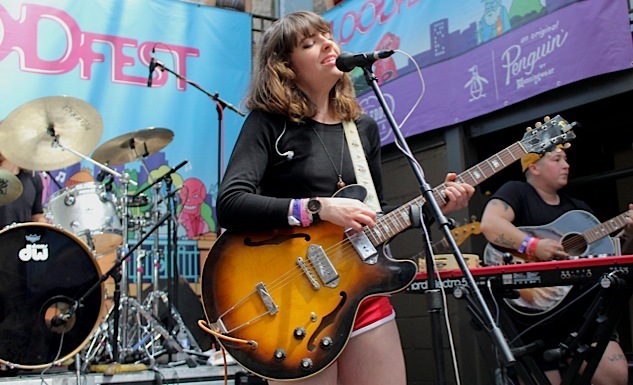 Philly quintet Hop Along opened up Flood Fest’s Friday afternoon showcase at the Cedar Street Courtyard. 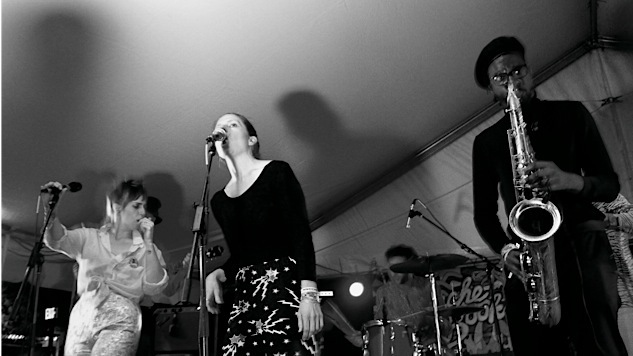 The tall slanted roof at the wide-open courtyard didn’t do singer Frances Quinlan’s raspy and impassioned vocals much justice—such is the story at many SXSW venues, and the bands can hardly be blamed. But it was still a pleasure seeing Hop Along play cuts like “How Simple” and “Not Abel,” off of their upcoming album, Bark Your Head Off, Dog (out April 6 on Saddle Creek), just as much as it was to hear favorites like “The Knock” and “Tibetan Pop Stars.” Kurt Vile and Speedy Ortiz’s Sadie Dupuis could be seen in the overhead catwalk taking in Hop Along’s set and it helped temper any sound issues with an intimate feeling of being among the artists. At the end of the day, Hop Along isn’t really a band that can roll with the sonic inconsistencies of SXSW’s “yolo soundchecks” or suspect sound engineers (nor do they have to.) It comes as no surprise that they haven’t played the festival since 2012. This is a meticulous band that deserves an equally meticulous sound setup. Can’t wait to catch them at a proper club when they tour their album beginning in May. Recent Sub Pop signees Moaning were the loudest band of the week. The L.A. post-punk trio punished Cedar Street’s speakers throughout their set but ultimately lacked definition and came across as overmatched on a bill stacked with indie heavyweights. The iffy venue sound didn’t do them any favors either. While shows seem to be less overcrowded and more comfortable than in years’ past, it’s still a little ominous to see a Fire Marshall-led team scrutinize a venue at many of these shows. It seems as though local venues and the Austin FD need to communicate better on what’s going to fly and what isn’t moving forward. Well dammit if this wasn’t the most surprisingly awesome set of the day. 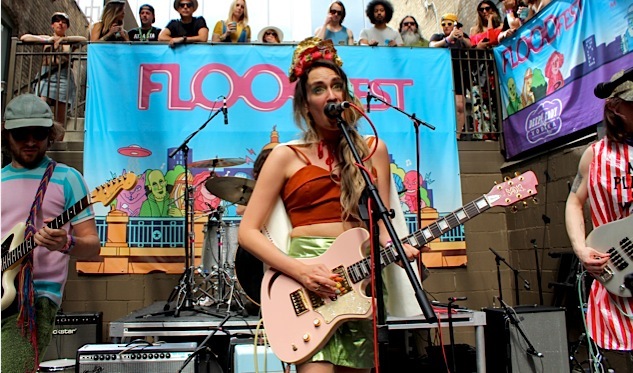 I think I questioned this band’s direction a bit following Sadie Dupuis’s more electronic and experimental Sad13 solo project, but Speedy Ortiz has always been a smokeshow of a band. A Backstreet Boys soundcheck? Sure. A sax player peppered into the set? Into it. The band’s wild guitars crushed songs from 2013 debut LP Foil Deer and 2015 follow-up Major Arcana, like “The Graduates,” and “Raising the Skate,” and showed that the new material off the upcoming Twerp Verse (out April 27 on Carpark/Company) might well be just as lasting. By the time set closer “Tiger Tank” came around, Dupuis and Speedy Ortiz had the Courtyard crowd hyped (even though nobody was dancing). It’s exciting to have this band back on the scene. 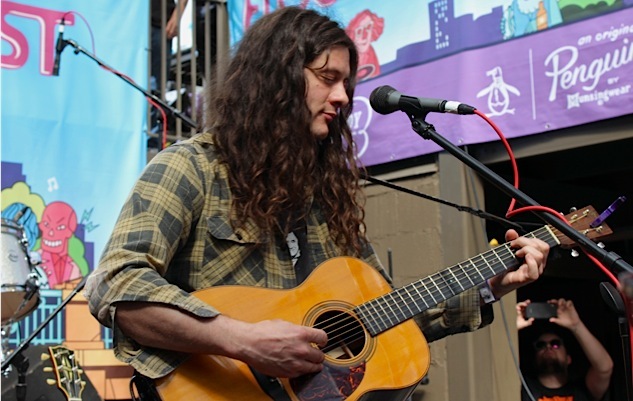 Sound issues didn’t affect Kurt Vile’s solo set, which saw him playing with two different acoustic guitars and an occasional harmonica. Considering Vile doesn’t have any new music on deck, this set was a real treat, his voice enveloping the hell out of the Cedar Street confines. He had what seemed like a locals-heavy crowd wrapped around his finger. What makes Vile such a gem is that he’s such an unabashed music and guitar geek. When he watched other sets before his, his fingers twitched as if he were envisioning the sounds around him on a fretboard. His delivery is intrinsic and rather detached from the audience, but he has quirky charisma. “What do you guys wanna hear?” he asked the crowd. A couple people shouted favorites and sure enough, Vile closed the set out with two requests. The finale was an immaculate rendition of “Peeping Tomboy,” from 2011’s Smoke Ring for My Halo. Vile is not only one of the best damn songwriters in the game, he’s also one hell of a performer. As the set came to a close and the crowd roared in approval, he stood up, raised his hand in a thankful gesture, flashed a smile and departed the stage. Everyone was happy.